One of the sailing lines operating out of Salem, Massachusetts, in the early 19th century. I don't know anything more about it, but the flag was distinctive: burgee-shaped with a deep swallowtail, the hoist yellow as far as the fork with the blue letters WP, the upper tail red and the lower tail blue. The Ward Line was formed by James E. Ward of New York in 1856 as a scheduled cargo and passenger service using sailing vessels. When the line began shifting to steam after the Civil War, it officially became the New York & Cuba Mail Steamship Company, but was always known as the Ward Line. After Ward's death in 1894, his successors carried on until 1907, when they decided to sell the company to Charles W. Morse's Consolidated Steamship Company. Consolidated collapsed a year later, and Ward Line passed to the Atlantic, Gulf & West Indies Lines, within which it operated under its own name. The line's reputation went downhill and was severely tarnished by the shipwreck of the cargo-passenger ship Morro Castle in 1934, the worst ocean disaster ever to occur to a U.S.-flag merchant vessel. The Ward Line briefly regained its independence after World War II. When AGWI went into liquidation in 1954, a group of outside investors bought the Ward Line subsidiary. However, the new owners did not want to accept the conditions imposed by the U.S. Maritime Administration for the receipt of government subsidies, so they began shifting the Ward Line away from the U.S. flag. In addition, as they diversified the company's businesses, forming Ward Industries as a holding company, they paid less and less attention to shipping, and in 1956 sold the name and assets to the Cuban company Cia Naviera García, which renamed itself Ward-García. Ward-García kept the name alive until 1959, but the combination of declining demand and the Cuban Revolution soon put it out of business. The Ward Line flag was always a white swallowtail with a black W inside a black ring. Sources: Lloyds 1912, Wedge (1926), National Geographic (1934), Talbot-Booth (1937), US Navy's 1961 H.O. Ward changed their house flag after the Morro Castle (1930) disaster in 1934, and adopted at least 2 more under AGWI until they were liquidated in 1953. Ward Line. Talbot-Booth (1936) mentions that the original Ward flag was done away with although he does not give it happening until 1939 and does not specify it being replaced. Up until 1938 he showed the flag given by Joe but with his announcement of the change in his 1942 Merchant Ships he shows a tapered version but it is not clear whether this is meant to be a replacement In fact Brown 1929 and 1934 and the National Geographic (1934) all show such a version anyway. More to the point in view of Michael's comments is that Talbot-Booth shows a second flag of a blue tapered swallowtail with a white star within a white ring [see above] under the name of the Cuba Mail Line. No information on this company. The flag was a blue burgee-shaped pennant with a white disk. Thomas Wardle. 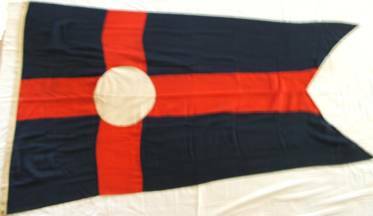 The Mystic Seaport Foundation dates him 1840 on the East Indies and California service also showing the same design, but as a normal rectangular flag, as an alternative. The pennant flag of the George E. Warren Corporation from Vero Beach, Florida, USA ( http://www.gewarren.com/ ). The company wholesales and blends petroleum products. It has no subsidiaries and no affiliate companies. George E. Warren is a major private wholesale distributor of petroleum in the eastern US. Founded in Boston by George E. Warren in 1907 as a coal and oil distributor, it moved to Florida in the early 1990s. The company distributes product mostly by barge and pipeline, though it uses some tank trucks as well. Warren has distribution facilities in the southeastern and southwestern US. It distributes products including ethylene and heating oil to various industries. President and CEO Thomas Corr owns the company." This means that the pennant may well be, or has been, in use as a house flag. Quite possibly so, but it would be well to remember that all we have so far is a flagoid, without evidence that it was ever actually flown in the cloth in any context at all. Warren Petroleum was established by William K. Warren in Oklahoma in 1922. It became a subsidiary of Gulf Oil in 1956 and seems to still be in operation as a division of Chevron, which merged with Gulf in 1984. I do not believe it still operates ships, however, as it seems to be mainly in the natural gas distribution business in the Midwest and Southwestern U.S. The house flag was green with a white W circumscribed by a white ring. Until the 1970s, Waterman was exclusively in the business of providing ocean transportation between the Gulf of Mexico and the Mediterranean. Since then it has diversified its services. It was founded by John Waterman as the Mobile, Miami & Gulf Steamship Company, with the motive of building up the port of Mobile, which had long been overshadowed by New Orleans. Waterman got his start managing war surplus ships that belonged to the U.S. Shipping Board. Because of good management and effective lobbying in Washington, it flourished despite vicious competition from Lykes Brothers. After World War II, Waterman became the third largest fleet under the U.S. flag, with 55 ships in service in 1949. Malcolm McLean bought the company in 1955 and put it into danger of bankruptcy by drawing on its assets to fund other shipping ventures, but it was rescued by new buyers in 1965, survived reorganization under bankruptcy court protection. It now focuses on servcie from the U.S. east coast to the Middle East and South and Southeast Asia. The flag as shown on the company website is a slightly tapered blue swallowtail, with a black W on a white lozenge. Other sources show the same design on a rectangular field, and Talbot-Booth (1937) shows a red field. Waterman Steamship Corporation. Talbot-Booth noted the change from red to blue for the flag field in his 1938 "Ships & The Sea". Webb and Knapp is a New York real estate development and architectural firm, and I have no idea why they would have had a shipping fleet, but this flag--white with a wide blue horizontal stripe bearing a white diamond with a red P--shows up in the U.S. Navy's 1961 house flags book. The initial "P" suggests that this may have been a successor to some other line that W&K bought for diversification purposes, but I really have no idea. Webb & Knapp Inc. The obvious answer would seem to be Penn Shipping Co. Inc. who existed from the latter 1950s to c.1980 as it is unlikely that there would be two New York companies at the same time using identical livery. The only shipping connection that I can trace for Webb & Knapp Inc. is that they held hull insurance and assume that the shipping interest was an offshoot to the main property development in which Webb and Knapp were a major player under the control of William Zeckendorf. No information on this company. Flag was a blue trapezoid with a white star in the hoist. No information on this line, either. The flag was red with a white H, clearly shown as shadowed in black in Wedge (1951). I don't know what the H might have stood for. Wells & Emanuel is apparently a New York company as reported by Mystic Seaport.org. The flag is a red swallowtail with a blue cross throughout, in the cross’s centre a white disk bearing the black initials ‘WE’ (may we suppose the letters were readable on the reverse?). This flag is among the “Private Signals of the Merchants of New York” (clickable chart - the seventh one on row four). - the second one, third on the same row and bearing no. 27.1.11, has the initials; refs. given are 54 and 62 (now ‘Empire Line’ is added but I do not suppose that the name has any influence on the presence or absence of initials). 14. 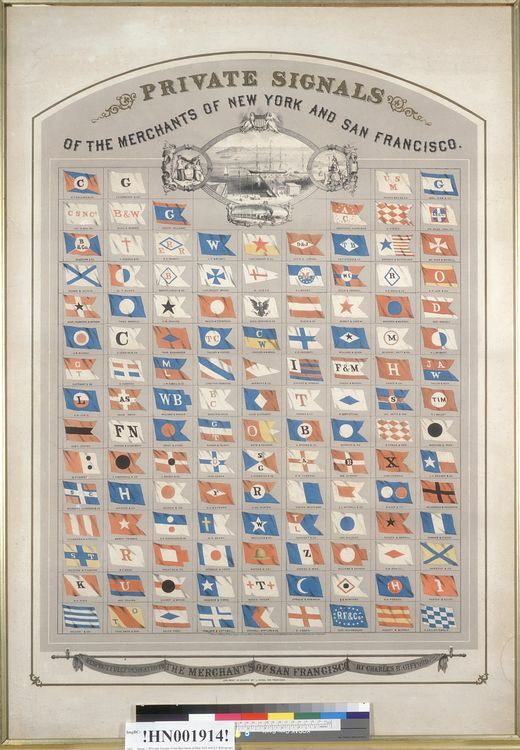 House flags of New York, 1800's poster in the "The Clipper Ships"
76. House flags from Mystic Seaport Library (Part 1 of 2 - part 2 is in Mystic). An earlier line by this name was apparently bought out by Pacific Coast Steamship, which later became part of the Admiral Line in the early 1900s. This is obviously a different company given the source, but I have found nothing about it. The flag was blue with a large white disk bearing a red W.
West Coast Steamship Co. Appears to have originally been West Coast Trans-Oceanic Steamship Line which would explain the flag shown by Brown 1958 where the red letters "T/O" are used instead of the "W". Apparently operated post WW2 until the early 1960s. The flag of J.W. Westcott was shown on the Boatnerd site (no longer available). The flag is a white, tapering swallowtail, edged above and below in red, and bearing the name WESTCOTT in blue letters. Another photo shows this flag with the name in a different font and the tongues edged red, as well. This Detroit based company is rather special, delivering mail, messages, food and whatnot (people, too) to ships on the Lakes, not counting office hours and busy at it between April and Christmas. (I should note here that during the other months its clients are usually laid up.) And so a particular boat carries a US Zip Code all its own! Other services rendered include piloting for Detroit. Official postal deliveries have been going on since 1895 – the firm was founded in 1874 by John Ward Westcott to do just that – deliver things and people to ships, sailing or otherwise. Perhaps the house flag has never changed: it has a definite 19C look! This clickable photo shows a rectangular variant among the many flags flying on the Great Lakes Maritime Center at Port Huron, Michigan: http://www.boatnerd.com/news/newsthumbs/images-09-3/GLMCFDAA-016-(4992-x-3328).jpg. This company appears in New York state documents on shipping and canal boat companies as early as 1859, when it was operating 14 steamships, 2 sailing ships, and 164 canal boats on Lake Erie and the Erie Canal and had 1,000 employees. Obviously it was still in business in the early 1900s. The flag was red with a white W.
Western Transportation Co. Formed 31.12.1855 it was reorganized 4.12.1883 becoming the Western Transit Co. as a subsidiary of the New York Central Railroad and then in 1916 following the passing of acts forbidding railroad companies to own fleets the ships were sold to the newly formed Great Lakes Transit Corporation. Lloyds (1904) shows a different version having a red swallowtail with a white circle but with both sources quoting the old name the position is unclear. For all practical purposes, Western Union has been the U.S. equivalent of a national telegraph company. It was originally founded as the New York and Mississippi Valley Printing Telegraph Company of Rochester, New York, and changed its name to Western Union Telegraph Co in 1856. In 1861, Western Union completed the first transcontinental telegraph link, introduced the stock ticker machine for the New York Stock Exchange in 1866, and established the first consumer credit card in 1914. With changes in communications technology, telegrams are no longer an important source of business, but Western Union still operates the world's largest electronic money transfer service. Western Union's shipping fleet was, of course, cable laying and cable repairs ships. These included the C.S. Minia, which was contracted by White Star Line to search for debris from the Titanic, and the 130-foot sail schooner Western Union, launched in 1939 and still engaged in cable maintenance in the Caribbean and Gulf of Mexico until 1974. It is now a separately owned cruise ship. I don't find anything listed under Western Union in Lloyd's Register for 2001, however. The Western Union house flag was interesting, a blue burgee-shaped pennant with a white border. Horizontally across the center was a horizontal band thinly striped diagonally in blue and yellow, fimbriated white, between the white letters W and U. I take it that the horizontal band was intended to suggest a coaxial cable. Unfortunately, I can't find the source for this flag; it was one of the numerous "flags and funnels" books. I will send the source when I track it down in my notes. Western Union Telegraph Co. Brown 1951 and 1958 (Wedge (1951)) show the flag but with white diagonal bands not yellow. A different version entirely is shown in "Cableships & Submarine Cables" with a yellow tapered swallowtail bearing a world globe between a small "W" at top and a "U" at bottom, both black and completing the encirclement of the globe are many small black ? which may be letters, it cannot be made out. The company was merged into the Western Union Corporation in 1987 as part of what is basically described on one site as part of a downward spiral which has in effect left the name only in existence. According to Brown 1995 Westwood Shipping Co. changed to a white flag bearing an orange stylized "W" and the logo appears on their website but in red. William S. Wetmore was a prominent merchant shipping operator in New York from the 1820s until his death in 1862. He made a considerable fortune in the China trade and is famous for having been the first wealthy New Yorker to build a summer "cottage" in Newport, Rhode Island, in 1852. This particular venture was founded as Alsop, Wetmore & Cryder and was mainly engaged in the Peruvian guano trade. The flag was quartered white and red, with black Ws on the white quarters.